Ford India is all set to unveil its new global vehicle at the 2012 Delhi Auto Expo. The company has revealed a teaser image of the vehicle which looks like it is the upcoming Eco Sport compact SUV. Ford India will also display its fleet of cars such as the Figo, Fiesta Classic, global Fiesta and the Endeavour. Besides, the company will also showcase its technological prowess by displaying the Fiesta’s body shell and will entertain audiences through 3D films about Ford vehicles. 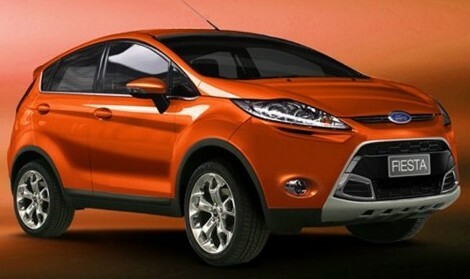 The Ford Eco Sport codenamed B515 is a 5-seater, sub-4 meter SUV built on the new Fiesta platform. The teaser image suggests that the upcoming SUV will have sharp lines and will borrow design cues from the global Fiesta. The Eco Sport will likely have chrome inserts on the front grille, a headlamp cluster similar to the new Fiesta sedan and triangular fog lamps. As expected from SUVs, the Eco Sport will likely have large wheels, flared wheel arches and high ground clearance for occasional off-roading. On the interiors, the Eco Sport may have interiors similar to the Fiesta minus gizmos like the voice activated controls offered in the Fiesta. The headroom, legroom and shoulder room should be adequate for five adults. The boot space could be slightly more than that offered in premium hatchbacks and will likely be at par with entry-level sedans. The spare wheel will likely be mounted on the rear to free up boot space. Ford may use the 1.5-litre diesel engine that powers the Fiesta diesel for the Ecosport as well. This motor puts out 89.7 bhp of power and gives a mileage of 23.5 km/litre as per ARAI ratings. The Eco Sport may not come with a 4×4 system initially and may get a 4WD variant later if it gets one at all. The Eco Sport, like the Figo, will be under Ford’s ‘One Ford’ strategy according to which the company will design products for the global market rather than individual domestic markets. The Eco Sport may be manufactured locally and may be exported to Africa and some South Asian countries. With regard to competition, the Eco Sport may not face much of a challenge from the unpopular Premier Rio. However, Mahindra will likely launch the 5-seater Xylo early next year and this could be a potential rival for the Ecosport. Compact SUVs have an advantage in terms of road presence, commanding road view and a high ground clearance to tackle bad roads. However, this is a niche segment and the response it gets from buyers is yet to be seen. Would you prefer a compact SUV rather than a sub-Rs. 10 lakh sedan? Share your views. « Question of the day: Maruti Suzuki Swift or Tata Indica Vista?